Yellowbird is a spacious and cheerfully tropical deluxe villa that celebrates the joys of island living with traditional Jamaican design and spaces that open on every side to embrace views of the sea and the lush Tryall property. 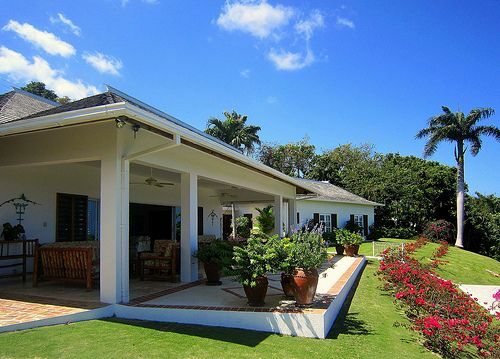 Situated on Barnes Hill, Yellow Bird commands spectacular views of the golf course, pretty gardens and the Caribbean Sea. Built on one level in Caribbean style and surrounded by lush gardens and lawns, Yellow Bird exudes a joyful aura so typical of Caribbean living. The villa boasts very spacious bedrooms with three guest rooms to the west and the master suite in the villa’s east wing. The Master bedroom has two queen size beds with a large bathroom with bath and walk-in shower and a separate dressing area. Two guest rooms have two double beds and one guest bedroom has two twin beds that can be converted to a king. Each has a spacious newly refurbished private en suite bathroom with walk in shower with marble tiles throughout. The spacious open living room with comfortable furnishings, built in bar and games table opens to the covered veranda. Beautiful lawns and gardens bursting with tropical flowers border the large pool and deck. Breakfast, lunch or a casual candlelight dinner can be enjoyed under a floral pergola and for more formal occasions there is a dining room that opens on to the patio and out to the view of the Sea.